The Chinese smartphone brand Vivo is all set to launch its latest smartphone called Vivo V15 Pro, and that device will come with the 48 megapixel rear camera along with a pop-up camera which will sport at 32 megapixel sensor. Well, it seems that Vivo’s sibling Oppo is also gearing up to launch a new device and it is called Oppo F11 Pro, the renders of the device surfaced online which suggest that it will also follow the same camera setup of the Vivo V15 Pro. 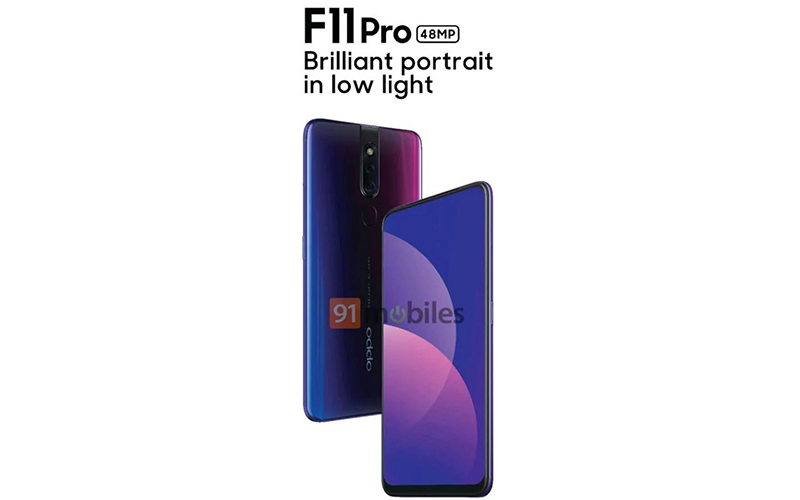 The renders of the upcoming Oppo F11 Pro gives us an idea about how the device will look like, and tips that the device will rock a 48 megapixel rear camera along with a 32 megapixel selfie camera which will pop-up from the top of the device. Because of the pop-up camera setup, the device doesn’t have any kind of notch and it has the bezel-less design. The company has placed the camera in a vertical orientation at the back and below of the camera module, you can see the fingerprint scanner and the device has the gradient design. Moreover, the source also claims that the device will be launched in the Indian market in the early days of March and it will be powered by MediaTek chipset. So, that’s all the information we have at this moment of time. We believe to hear more about the same in the coming days and we recommend you to stay tuned with us with the latest updates at your fingertips.